Posted on July 19, 2012 by Sarah L.
My uncle Dan is in town from Florida for a couple of days. He is my dad’s brother, a Littlefield through and through, although completely opposite from my father. We went to Florida to visit that side of my family when I was somewhere around the age of 12 or 13 and stopped in a gift shop at the Nickolodeon area of the park. We got a set of Pinky and the Brain little bendy action figures, and gave my dad Pinky (to remind him of my uncle) and my Uncle Dan got Brain, obviously my father. So, with that early association, that’s always how I have thought of them. Pinky and the Brain. One is a genius, the other insane. Day 29. And boy, does that ring true. I’ve spent as much time as possible around my uncle as possible because I know it will be a while until I get to see him again, and who knows, I may not ever. We were sitting at the dinner table last night, and they were telling me stories of their glory years. My uncle had just gotten out of the military and was willing to pick a fight with anyone who looked at him cross-eyed. My dad, younger by two years, was much more logical and tended to be more of a runner than a fighter. It was one after another story about bar fights, fights with bike gangs, bricks, baseball bats – my uncle charging forward at full speed, and my father unsuccessfully talking him out of it. After one fight, to get back at a guy, my uncle doused his car in gasoline to set it on fire, but couldn’t light the matches and had to walk away. I’m surprised they survived it with as many teeth as they have left. Day 30. 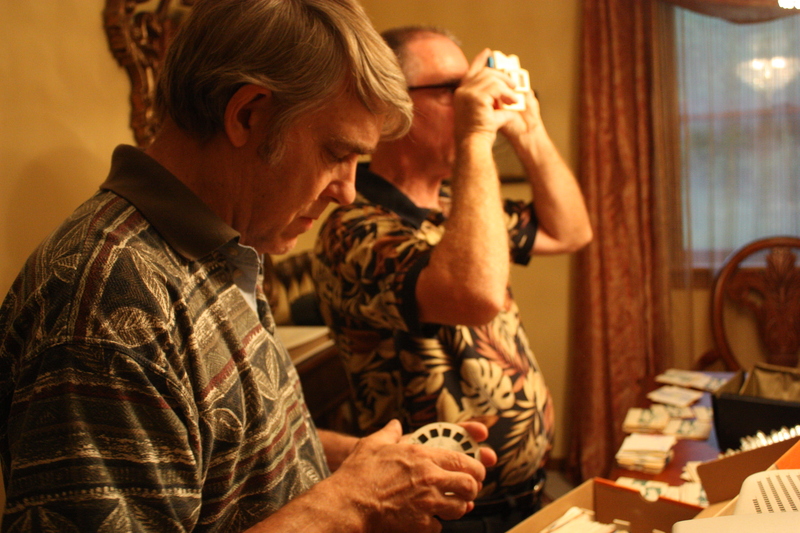 Tonight, my dad and uncle were in the dining room when I got home, looking through a ViewMaster (Google that if you don’t know what it is) at photos from the 50s and 60s their grandfather had taken. I adore these pictures. Not many people can say they have seen their father (in 3D) in a full cowboy getup, at age 3. They are old and spotty with discolored film, and you have to hold the viewer up to the light, and click through each of the pictures. It’s pretty amazing to think this was technology over 50 years ago. It still seems pretty darn neat today. It was so touching to see my dad and uncle as little boys, my grandparents who are no longer around, and what they had. They lived in an eight-foot wide trailer and had hand me down everything, and wanted for nothing. My dad’s first bike was nothing more than a pile of rust with wheels, but he had a beaming little toothy smile while riding it. They were dressed as cowboys in nearly every picture. “The only good indian is a dead indian!” says my uncle in a low, mocking voice. And they both laugh because I’m sure they heard it and said it a thousand times as kids. My dad tells me a story about getting a rifle for Christmas he had wanted so bad, and my uncle breaking it the very next day – not exactly the Jean Shepherd version of the story, but they laugh about that too. My father is a very proud person, and both he and my uncle have a lot of pride in our lineage. These photos are a small piece of that – and I get it. I don’t even remember having met my grandparents, but my dad tells me I have his grandmother’s lips, and Arthur has the same lanky walk as my grandfather. There is something borderline spiritual about being able to see where you come from, and hearing about a past that you can almost make out, as if you were already there. Our family has our genealogy traced back to the Mayflower, and if you asked my dad and Uncle Dan, I think they’d be able to recite half of the names. I haven’t decided if I care much about where I came from. Sure, it’s neat to say I’m related to William Bradford, but I’m not sure that I’ll ever allow it to have meaning. It seems pretentious to think that where we come from matters at all. On the other hand, I can almost feel how close I am to parts of a past I know only through hearsay. I’m glad I have the pictures and the stories to help me connect the imaginary dots. Lol I was just doing research in viewfinders today for the wedding! They are really fun! I’m not sure how they work anymore…I’m guessing they’ve gone digital? Thats one of the problems we were having – we put them in the projector and the 60 year-old glue started melting and the pictures were falling apart. They definitely do not last forever! A lot of character though!